Direct Bayonet to 80% shut off valve - GAS IT Leisure Gas Bottles, Gas Cylincers and Gas Tanks - Catering, Motorhome, Campervan, Caravan, Farrier and Road Repair Refillable Gas Solutions. 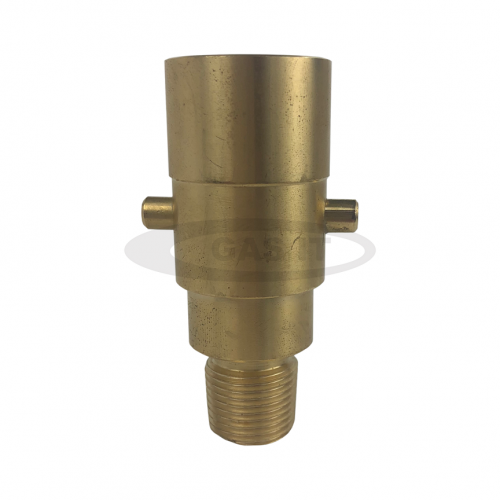 These GAS IT brass fill point adaptors are specifically made for us here at GAS IT to high OEM engineering specifications and exact build tolerances which means they are guaranteed to work in country of use. Why pay less elsewhere for unknown country compatibility and use problems. GAS IT EASYFILL SKY© Bayonet fill point to 3/8bspt is for converting an already purchased self refillable gas bottle to the on-bottle filling function. Our GAS IT EASYFILL SKY© UK bayonet fitting connects directly to the 80% shut off valve on our GAS IT bottles or GAS IT Tanks. When fitted it behaves in exactly the same way a remote or in locker fill kit does except the fill point is on the bottle or tank its self. When used on any brand of Refillable gas bottle, one's fitted with an 80% shut off valve obviously, you remove the usually fitted JIC fill elbow where you would usually connect your remote fill hose fit this GAS IT UK bayonet (using PTFE paste or tape) which then allows direct filling on the refillable gas bottle or gas tank itself. These will work with out European adapter as the inside of our SKY adaptors are threaded. The bottles own automatic shut off function in the 80% valve means the bottle will shut off once the Autogas gun is removed. This fillpoint might not be approved for use in your country.